I am still hurting, which means it’s time for more soup. It’s filling, nutritious and yes, PALEO! 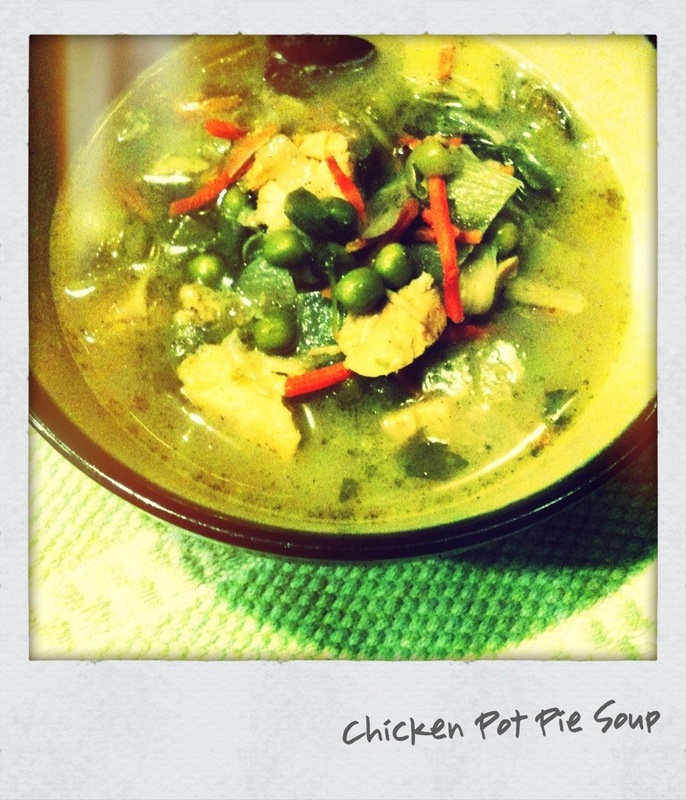 I like this soup for a lot of reasons, mostly because it’s tastes like chicken pot pie (at least the filling!) it’s a pretty classic chicken soup but it has one special ingredient that makes it creamier and a little more hearty than a broth based soup. Since it’s paleo, you know that I am not talking about flour…so you’ll see the ingredient in a minute. It’s not really a cold day, but I love soup for lunch, or dinner, gosh I think I just love soup any time, but especially when I am not feeling the greatest! Also, this was a hard one to take a great picture of, so it’s a little more artistic…I think I would be lost with the delightful photo editor apps on my iphone! I love technology! 1. In large stock pot add chicken breast and chicken stock. Simmer on low heat until chicken is cooked through. About 10-12 minutes. 2. Once chicken is finished cooking, remove from stock and cube into bite sized pieces. You might allow it to cook for a few minutes so you don’t burn your little paleo mitts! At this point I put my diced chicken and the cooking liquid into a large bowl and set aside, because I didn’t want to get my other soup pan dirty. 3. Now that the soup pan is empty of stock and chicken, start again with 2 T of fat. I chose butter, olive oil and coconut oil would work as well. Over a med heat melt the fat and add your mirepoix (that’s the fancy french term for onion, celery and carrots) Sweat onion, celery and carrots for 3-5 minutes, just enough to soften them up, but not add any color. 4. Add pearl onions, leeks, mushrooms, peas, garlic, parsley and poultry seasoning. Mix well to coat all ingredients with seasonings. 5. Add stock and chicken back into the soup pot, then add the secret creamy ingredient….1 can of coconut milk! I would recommend adding an additional 2 cups of water or stock at this point. 6. Cook on a low heat for about 30 minutes. Season with salt and pepper until it pleases your palate! PS: If you have a paleo biscuit recipe, by all means share it. I thought about creating one last night, but I gave up. Someone has one, I know it! I am with Natural Grocers by Vitamin Cottage. We have a store located in Overland Park with a kitchen. We are looking for local Chef’s to conduct cooking demonstrations for our customers in the kitchen. We want to focus on Paleo. Please contact me if you think this is something you may be interested in doing and I can give more detail. I can be contacted by email or at my office in Denver, CO @303-986-4600.